Oh, hi everyone! Sorry I was being lazy because it is my day off. Many of you know how to connect two verbs with ~て ( = te) / 〜で ( = de). = Sakuya wa utatte odotta. = I sang and danced last night. Note : The speaker is focusing on two actions, singing and dancing and that’s it. ★　to do A and B and other stuff (etc./ such). = Sakuya wa utattari odottari shita. And the order of the verb is not important. = Eating and sleeping and etc. Note : たり ( = tari) or だり ( = dari) ? ☆When you continue the sentence. Repeat たり（ = tari) twice. 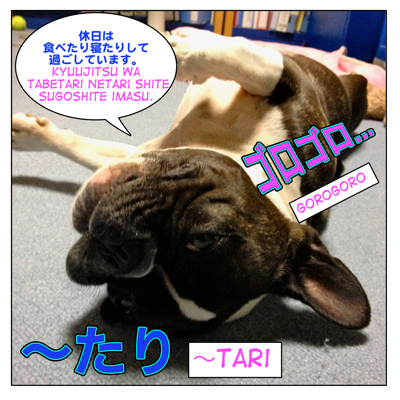 We use たり ( = tari) when we give examples or express repeated actions. = Itsumo okottari kanashindari suru nowa mou iyada. = I don’t want to be angry or feel sad all the time anymore. = Maggie wa omocha de asondari sanpo ni ittari suru no ga sukida. = Maggie likes to play with a toy and going for a walk, etc. = Saikin wa gaishutsu shitari eiga wo mini ittari suru nowo tanoshin de iru. = I’ve been enjoying things like going out and going to see a movie lately. = Kyonen wa shigoto de niho ye ittari kitari shiteita. = I went to Japan back and forth for my work last year. = Eiga ga hajimattara keitaidenwa wo tsukattari oogoe de hanashitari suru nowa yamemashou. = Once a movie starts, do not use the cellphone or talk loud. = Kyou wa amega futtari yandari da. = It’s been raining on and off today. = Gakkou ni kitari konakattari suru seito ga imasu. = There are students who sometimes come and sometimes not to come. = There are students who don’t come regularly. = Isogashii hi wa tabetari tabenakattari desu. = When I am busy I sometimes eat and sometimes don’t eat. = When I am busy I sometimes skip the meal. You are supposed to use たり(=tari) twice in a sentence when you connect two verbs. 1) to do something and etc. = Nihongo wa anime wo mitari Maggie Sensei no saito mo tsukatte benkyou shimasu. = I study Japanese watching “anime” or using Maggie Sensei’s site also. You are supposed to say　マギー先生のサイトを使ったりする( = Maggie sensei no saito wo tsukattari suru) but sometimes you drop the second たり(=tari) in conversation. actually you do hear those a lot in daily conversation. My site is to teach “Real Japanese” so I will teach you anyway. = Oyasumi no hi wa nani wo yatte iruno? = What do you usually do on your day-off? = Hon wo yondari shimasu. = I read a book and etc. = Tama ni jimu ni ittari shiteru? = Do you go to the gym and stuff once in a while? = Saikin wa sakkyoku wo shitari shiterunda. = I compose music and stuff lately. 2) to soften your speech avoiding sounding too straight (direct). = Watashi no nihongo ga machigatte ite mo warattari shinai de kudasai. = Even if my Japanese is wrong, please do not laugh at me or anything. =Hajimete no deeto dattara kechittari shianai hou ga iiyo. = If it is your first date, you shouldn’t be stingy and stuff. = Danna ni uwaki saretarishite mo heiki nano? = Are you really going to be OK if your husband is having an affair and stuff? = Watashi no kimochi wo kare ni shiraretari shitara komaru. = I will be in trouble if he finds out how I feel about him. = Charaku mieru hito ga jitsu wa majime dattari surundayone. = The guy who looks shallow could be actually very serious, you know. = Kono hi no koto wasuretari shimasen! = I will never forget this day. = Sonna hidoi koto shitari shimasen. = There is no way that I will do such a horrible thing. = Shiranai hito ni tsuite ittari shitara ikemasen yo. = Do not follow any strangers. 5) When you assume something. = Maggie, kondo no yasumi himadattari suru? = Are you happened to be free next weekend? Note : Again this type of speech may annoy some people. But a lot of young people use it. I would say do not overuse it. It sure does sound a bit shallow. In casual conversation, we end the sentence with ~たりして… ( = tarishite….) when we imply some possibility in a subtle way. = Maybe Maggie likes Max, you know. = If I start to live alone, I might be able to get a boyfriend right away. = Ah a… Kore de watashitachi owaridattarishite. = Kocchi no hou ga yokattarishite. = Maybe this one is(could be) better, you know. It is more limited than verbs but たり( = tari) is also used with adjectives or nouns. noun A + だったり( = dattari) + noun B+ だったり( = dattari) = It could be A or B./ Sometimes A and sometimes B. = How I get to work? I sometimes use train, subway or bus. It depends. Note : Again this type of speech is very colloquial. A , B and etc. , we use や( = ya) to express ~ and etc. =My mom’s cooking is sometimes delicious and sometimes not depending on her mood. = Kare wa hi ni yotte genki dattari soude nakattari shimasu. = He is sometimes active and sometimes not, depending on the day. = Minna wa oyasumi no hi wa nani wo yatte imasuka? = How do you spend your days off? Hi sensei, what’s the meaning of tari in this sentence…? ~ is not feeling nervous* or overly excited. This is one of the answers to a question about how they felt after wearing their performance costume for the first time, for context! I noticed that the the beginning part, これから稽古だったり, is a noun + だったり form- but there’s only one. You did mention that this is pretty colloquial, though! So, is this why it’s a bit difficult for me to understand or is there something I’m missing? Thank you so much for taking the time to read this, and I hope you’re doing well!! Yes, it is a casual way of writing. I will become better just with knowing more vocabulary/grammar or I will need something more/else? = Mou neta hou ga ii. = I should better go to bed now. = Mou neta hou ga iiyo. = You should go to bed now. If you learn some grammar pattern, you will start to hear things and they make more sense to you. omgsh thank you so much <3 Your reply really motivated me, the best always <3!! It could sound more serious and the listener can take there is something wrong with wearing kimono. sounds more subtle than 急に泣いて which focuses on the fact she cried more. If you say 手を出してはいけませんよ, you focus on just one action. 出したり implies there are other actions that shouldn’t be done. Oooh my gosh you are amazing. That clarifies things a LOT for me. Thank you SO much. Just another question, based on your explanation, does the kimono sentence sound something like this in English? What’s up? You’re wearing a kimono and stuff.. Going somewhere? Yes, you can translate it like that! Though the speaker is just talking about one thing “kimono”, it sounds more subtle. There are many expressions like this in Japanese. You’ll see. If I said 「優しかったり楽しかったり感じがあります」, how would this sound to a native speaker? Would it be annoying, too colloquial, etc? If so, is there a better or a more polite way I could say this in Japanese? Also I heard someone use 「adj-たりとか、adj-たりとか~」. How does this sound to native speakers? First ( ~ たり）感じがあります part is unnatural. You wanted to describe someone’s personality? A is sometimes sweet and fun? I think the second one is uncorrect, but I wanted to ask. Thank you very much! But you are right. The second sentence is not natural. = There are happy things or sad things but that’s the life. Can you use たり form more than 2 times in a sentence? Also, do we need commas between each たり? Is it gramatically wrong if i used the sentence above instead of 学校の後でしゅくだいをしたり, 犬とあそんだり, 晩御飯をたべたりします? When do we use ~し〜し　vs　〜たり〜たり? I read that they can both be used when expressing multiple verbs/ adjectives/ nouns in a sentence without any particular order. Any guidance would be much appreciated! どうして仕事をやめたいの？ Why do you want to quit your job? 給料は安いし仕事はきついし… Because the pay is bad and it is hard and so on. I do laundry or cleaning and etc on my day off. Yes, I agree tari is the best for giving multiple examples here. But, if I want to say and imply that “I was so busy on my day off. Because I did the laundry, I did the cleaning, etc” (Reason). May I use し to express that imply? Thanks in advance , Maggie sensei. Originally 起こる ( = okoru) but you use 起きる (= okiru) as well now. Thank you very much for your reply. So 起こるand 起きるare interchangeable? They are pretty much interchangeable besides certain exceptions. Hello! Could you tell me if I translated this song sentences correctly? The trip here has had moments that have been magical. or “We laughed and cried with many people. We have also supported each other”(The two persons only) is better? but not between “two people”, among many people. Can you have たり form and ことができます form in one sentence?? What happens is that the song is about two people (I did not put the complete lyrics) so I assumed that supporting each other was just something between them. いろいろな人達と could modify 泣いたり笑ったり and　支えあったり because it has the same suffix, たり. You are the cutest dog (except for mine). So tari can be used to express that someone would do something.? In this case ～たり implies other possibilities beside those, which were mentioned. So basically it means that the speaker would never do something bad to Ellen, like hurting her in any way. ～たりalso it adds lots of emphasis. Thank you for helping Robert, 天人 While I was sleeping! It’ Eren (it’s a german name) and he is male. Sorry, just when I had a look at it, I started laughing. Could you translate this sentence please? Unfortunately there are people who like forcing other people do things they dislike or laugh at them. So … even if we take into account that the song is about two people “We laughed and cried with many people. We would also support each other “(The two persons only)” would be incorrect? No, I wouldn’t say it is incorrect. It could be “two people are supporting each other”. It all depends on the context. Thank you for answering and for all your patience! Can you use tari with other verbs? Sorry, but what do you mean by other verbs? Hmmm yes… taberu, neru….many of my example sentences in the lesson have verbs other than “suru”. I have translated it the same way. in the sentence of the middle, it’s used to give an etc. to the number of functions you could have and in the following phrase, to emphasize that they are not looking for assistants? Don’t do things such as A and B. ～てくれる implies a favor which the speaker received. ～たり implies that the speaker is grateful for many things, and one of these is the translation stuff. と should be here translated as “for”. It stands for an explanation for what kind of fact is the speaker grateful. その件では通訳してくれたりと 大変 お世話になりました = I’d really like to thank you for helping me out with the translations (etc). I’d like to take this opportunity to wish you and Maggie and everyone here, who visits – let’s say – our website a Happy and Prosperous New Year, hoping that everyone will have many blessings in the year to come. May all your dreams come true! @天人 Thank you for helping Marianne and nice message for all of us! May your coming year be filled with joy, happiness and dreams. Do you have an example sentence where you saw the word? If it is used with other verb, it works like this. You can use this form as te-form. Stop walking/Stand still/ Stop what you have been doing once and then…..
立ち止まり( = tachidomari)+ Verb = to do something standing still/ stop walking/stop doing what you have been doing. = Zutto hataraite kita ga, tama niwa tachidomari (or tachidomatte) jinsei ni tsuite kangaeru koto mo hitsuyou da to omotta. = I have been working all my life but I came to think that it is necessary to stop working and think about my life once. 彼は立ち止まり、ドキドキしながら考えた. Was basically scratching my head. So the tachidomari is the same as tachidomatte is it? Thanks for the explaination Sensei! I think I am beginning to get the gist of it. Aww…Japanese language honestly isnt easy. Yes, it is the same as tachidomatte. So you can connect sentences using masu-stem like te-form. He was surprised to know the fact. = Kare wa sono koto wo shitte odoroita. = Kare wa sono koto wo shiri odoroita. Many learners get confused with this form. Will add it to the lesson list. That would be great!! Thanks a million, Sensei. Thanks for being so patient and helpful. _I’ve Been Learning Japanese For About Two Years, But Still Don’t Know What Really The Verb “Infinitive-Form” Is Used For? I Mean Sometimes Finds That It Mentions To Past Events, & Usually Followed By Another Verb In Events-Linked Phrase (Especially In Anime). Confused About It, I Really Need A Specific Usage, Onegai Shimasu! (1) to tell someone what you are going to do now. = That book is difficult so I am going to read this book. これ、食べる？= Do you want to eat this? 本、読む？= Do you want to read a book? 何、する？= What do you want to do? 彼、最近、ここに来る？ = Does he come here often? 私は、毎朝、８時に起きる。I get up at eight every morning. そして仕事に出かける And then I go to work. 日本人はお米をよく食べる = Japanese people eat rice a lot. この頃の若者は漢字を使わない。 = Young people don’t use kanji lately. 3. And you use it with other suffixes. _Well, This Form Isn’t Used Too Much, But It Does Change The Context?! Hmm? I thought you wanted to know the usage of infinitive form. You want to know when to use ます form? If so it is a polite form of the dictionary form. Or verbs such as あります／います describe a current state. And you can check my tense lesson. Hhhh I Was About To Correct The Typo For “Ga Aru” Into “Ga Iru” But Was Too Late After Putting The Comment! Mata Arigatou Gozaimashita Sensei !! In the beginning, I thought it was a typo with the use of double たら. However, when I conversed with my other friend using a similar sentence, just swapping 英語 with 日本語 and using “間違ってたら、変だったら”, she told me that it would’ve been better had I written “間違ってたり、変だったら”. I hope my explanation of my situation isn’t confusing. Both 1) and 2) are fine. Maggie-sensei, I truly enjoy reading your posts, and many of them are very helpful and well written with plenty of examples. I’m a beginner still, so please bear with me. About たり, what does と思ったり usually mean? Does it mean “also thought” or does it imply assumption or emphasis? Glad to hear you enjoy reading my posts. We leave the sentence unfinished with たり on purpose. I came across an expression when I was reading a novel but I can’t figure out by myself. I’ll give you the complete sentence and my interpretation about it. And when I have the first class of the new school term, I just end up listening to my colleages(classmates) bragging about exaggerated stories of their trips. Between them, a story from a guy who traveled abroad (NANKA MO ITARI SHITE? ), I always find myself in the side of those who just end up listening that kind of stories. I know there might be some incongruences in my “translation”, but more than considering it as such, I would prefer call it “adaptation”. But anyway…. I understand the concept of almost everything, but I don’t really know what’s the usage of NANKA MO ITARI SHITE. If you note something important to point out in my “adaptation-interpretation” please tell me, after all I’m just learning. And of course, I hope you can help me about that expression. Note: English is not my first language so forgive my possible mistakes. Is this really 登校目? I think it should be 登校日. Honestly, that was difficult to express. I already understand why I couldn’t figure out first time when I read it. Basically I just was mistaking いたる(至る) and　いる (two very differents verbs in every aspect). Anyway, that’s why it didn’t make sense to me. Tari is a form we used to list two actions or two states (or maybe more) but there are some cases when you can list just one action. Just like my example, right? What can the subject of this sentence do while he is waiting for his friend? where all the examples I gave are the “stuff” placed in the context, obviously they are different in meanings but they are things you can do while waiting for someone and therefore they have some things in common but since if not really neccesary to explain all the things you do, you just say “I was waiting for him while reading a newspaper and stuff like that”. Maybe I just misunderstand something or maybe not…In any case I understand more than before and I know what my mistake was. If something is wrong with what I have just say, I’ll appreciate all the suggestion/explanation you can do. The explanation about the “nanka” and the particule “mo” is an easy matter. I think I have no problem with grasp the concept about them. About the question: Is this really 登校目? I think it should be 登校日. Yes, you’re right. That was a typo. And about your japanese explanation. Especcially that “nao aru koto”. Could you please give me some details about that. Q. Tari is a form we used to list two actions or two states (or maybe more) but there are some cases when you can list just one action. Just like my example, right? A. Indeed. Sometime the speaker just wants that other examples are implied in supposition. We can translate this as: “etc / and so on / and other stuff”. This other examples belong to the same group（同類の事柄）. This other stuff in your example 「新聞を読んだりして友達が来るのを待っていた。」 would – most natural – be: watching TV. I think drinking water, having a meal or going to the toilet doesn’t fit in this group much. You have to image the most natural things that you do, when you are waiting for someone. You have to do something, that makes the time run much faster. You have to kill the time somehow, so you’re watching TV. Drinking water is a bit… strange. Q. I just figured the meaning by context but I don’t know how to put that into English Especcially that “nao aru koto”. Could you please give me some details about that. 他に同類の事柄がなおあることを暗示する。= It implies, that there are still other things, which belongs to the same group. It’s always my pleasure, Maggie! I’m happy that I could help a little. You have been a great help!! Thank you very much on behalf of everyone who asked the questions during my vacation! Maggie Sensei What is 魚も釣ってきたり mean? Catching a fish (or Fishing) also and…. Sorry but I don’t do the translation here but I can help you correct your translation if it is a short one. Also I am not sure if it is a part of a sentence. 1) Does it end like that? ~釣ってきたり。 or continues…釣ってきたり、…? OK, I will show you the structure of the sentence. Someone is working out (and building his/her body) + so (~から giving a reason) + what to to (giving an example) → he/she (sometimes) goes fishing and etc. 2) It seems like unfinished sentence. Is it from AKB song? Even that flower has a secret such as…(giving an example) (if you see the back side of flower), you may find ….and……etc. I think Japanese language is very difficult to understand and i’m not good at Japanese but when i read your blog that make me understand in Japanese such as grammar,vocabulary and etc. better than before. Just keep practicing your Japanese. Keep reading, writing, listening…and make a lot of mistakes. 身体を鍛えている から 魚も釣ってきたり。= Because he is building his body so he (can)goes fishing and etc. << Right? Sorry i'm not good at Japanese language. She was bullied often in middle school; she was often hit, pushed and left out by others. Hey, on one of the examples, the romaji says “sakuya” but the kanji says 昨日 (sometimes sakujitsu, so I can see where the mistake came from), just letting you know. Thank you for spotting the mistake, James. I fixed it. And I am sorry. I am not Victor. He has been promoting our site. I don’t understand the “conditional” part of this lesson. What does the use of たり in these sentences mean? How are they different than if you hadn’t used たり? If the translation is “could be” (probaby/maybe), shouldn’t the sentence be something like, 「チャラくみえる人が実はまじめでしょう。」? Ah OK, ~だったりする implies the possibilities. means “Shallow looking people are actually serious. ” and the speaker determines their opinion. I know Maggie Sensei has very little free time, but If you ever have the opportunity, I would love a lesson on all the nuances of でしょう/だろう! I see your problem. でしょう／だろう are used when we assume something but we don’t always say “probably”/maybe” in the translation. If you want, feel free to make sentences and leave them here. I will check them for you. ups! I said skype and then LINE, well, it is the same. sorry. Recently I´ve been talking in japanese with a friend on skype and so. Note 1) 最近 or 最近は : We use “は” only when you want to show a contrast. I used to talk to my friend on the phone but recently I have been talking to him/her on Skype and so. Note 2) have been = If the action is still going on, ~たりしています・〜たりしている is better. Thank you for the nice message from Argentina! Hope you come visit here often! Is it normal to sometimes drop the する　verb at the end? did they just decided to drop it, or is it a completely different grammar? This, of course, doesn’t change the meaning. Notice that in these constructions opposed verbs are used: 行ったり来たり、見えたり見えなかったり. ”あっち見たりそっちを見たり” is also opposed and means: looking here and there / looking here, looking there, looking everywhere. If I go to Hawaii, I can swim in the ocean, I can play golf and can do other things. Why is the tari form is use in the past negative, further more why is there no suru ? So this sentence connect the following things. There isn’t any example sentences with negative form, huh? I came across the verb “kaeri ni/ kaeri michi”. Can all japanese verbs be added with ri at the end just like kaeri? And what does it mean, sensei? Thanks! Thanks sensei! But is it possible to turn all verbs into -ri ending? But if I can think of any verbs which we can’t turn into =tari form I will let you know.